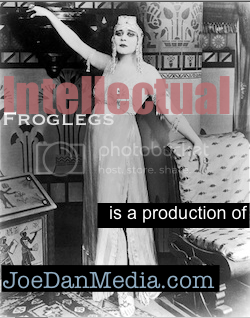 My name is Joe Dan Gorman, and you can blame me for Intellectual Froglegs. I created it, I write & produce it…and I host it. So, it’s pretty much my fault. In case you haven’t seen it yet— the ‘basis’ of Froglegs is to be covertly educational with humor, wicked cool graphics and classic tunage. And we’re not following the media narrative…or chasing the ‘media-driven outrage of the day”—- but we will talk about things that matter, from the historical to the hysterical. The best part…I get to ridicule liberals, atheists and other assorted anti-American jackasses. How fun. The most flattering compliment I get is when someone asks me to ‘thank my staff’… but as far as the writing, editing, researching and production of the show… I’m it. I also do all the website work. Now— there is nothing more important than God, so I invite you to enjoy some of the cool videos ay my God, Science & History page. Nobody quite articulates the incomprehensibly massive power of God like a physicist. God of Wonders is one of my favorites. Thank you so much for being here. Feel free to drop me a line. You can contact me here.